It isn't just about creating a theme these days, you have to have something special or different included and this new theme from JoomlaPraise is no different. 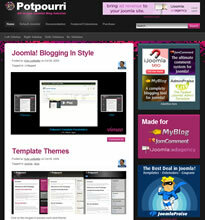 It is a theme specifically for the MyBlog and JomComment extensions as well as the Ad Agency extension from iJoomla, so if you are using one or all of those as I know some sites are, then this could be for you, if you also have a successful or popular blog or you are thinking of spending a few quid on a new one. It used to be that blogging and comments and putting ads on your site was all for free - how things have changed. Anyway, this theme from JoomlaPraise not only works with all those fuzzy commercial things, it also looks good all by itself and I'm a big fan of using Joomla all by itself with a select few extensions that do a very specific thing and tend to only work behind the scenes and this is a theme I'd use if I wanted to start a new blog. Some features, but not all. You've got more things too, like it comes with the source files and you can pretty much change whatever you want. But don't take my word for it, click here for more information.